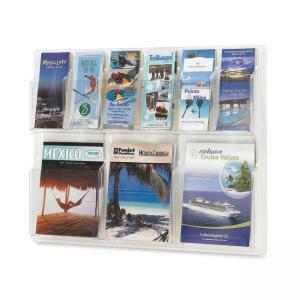 Safco 6-Pamphlet and 3-Magazine Literature Display Rack - 22.20"
Display rack features three magazine pockets and six pamphlet pockets. Each pocket holds up to 1-3/4" of material. Unobtrusive, break-resistant, crystal clear plastic rack blends into any office environment. Display insert keeps magazines, pamphlets and other literature straightened while preventing curling and flopping of pocket contents. Thermoformed one-piece units have no sharp edges or corners. Use included hardware to mount to a wall. Each magazine pocket measures 9-1/4" wide x 11-1/4" high. Each pamphlet pocket is 4-1/4" wide x 9-3/8" high. Display rack weighs 7 lb.